How much do you know about ransomware attacks? As IT pros, we are aware of ransomware’s impact and its triggers, but our clients, employees and families may not be. In these dark times, it’s imperative to know how to prevent a ransomware attack, because when it hits you — it’s already too late to find out you’ve left something uncovered. 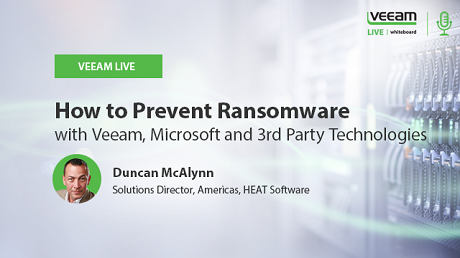 In this VeeamLive episode, Duncan McAlynn discusses the threats we are facing today with APTs, DDoS attacks and advanced phishing schemes to demonstrate how Veeam®, Microsoft and third party solutions can help protect and prevent ransomware attacks on your critical virtual machine (VM) workloads. During this webinar, we will be demonstrating Veeam and Microsoft’s solution accelerators, add-ons, community extensions and third-party products that address the susceptibility of your virtual workloads to these threats. Duncan McAlynn is a Certified Information Systems Security Professional (CISSP), a six time Microsoft MVP and member of the FBI InfraGard division. He’s laser-focused on helping our nation’s corporations and government agencies expand their use of Microsoft System Center technologies to improve their security posture and compliance.